This version is outfitted with a double-edged, black finished dagger blade and a snake skin pattern aluminum handle with black inlays. The AKC 777 Blackfinger is an Italian-made OTF knife with a double-action, automatic firing mechanism. It has a large aluminum handle that provides a solid feel and a comfortable grip for light duty cutting tasks. 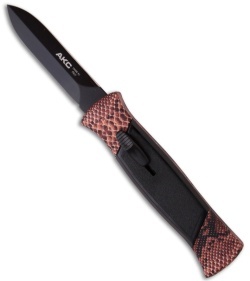 The blade is made from stainless steel with a stamped AKC logo. These come in a variety of blade and handle color options for every possible taste.